Yesterday, something crazy happened. My sweet baby girl turned one whole month old. Already. It seems like I was just announcing my pregnancy and then her arrival on the blog. And now I've already spent one glorious, beautiful month with Annabelle. 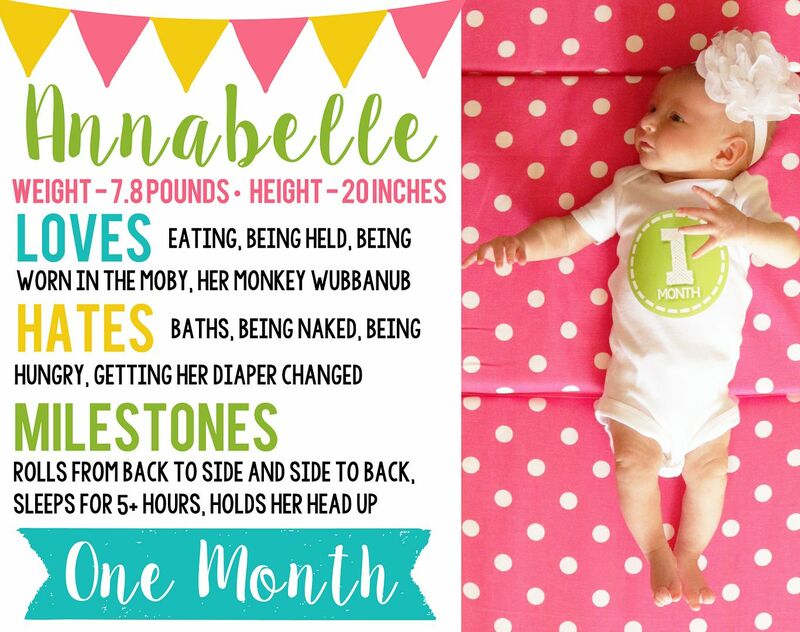 I can’t even believe it, but sweet little Annabelle is already one month old! She has a sassy personality so far, and we love her to pieces. She is so strong and eats like a beast. She’s a great sleeper, too, and she has amassed many nicknames: Anna Banana, A-Belle, Hungry Hungry Hippo, Miss Piggy, Chunky Monkey, Snorty, Annabellina, Stinkerbelle, and my personal favorite, Waaannabelle (when she’s crying). Annabelle still looks a lot like her daddy, but she definitely makes some of her mommy’s expressions too. She is constantly followed around by her fur-sister, Stormy, who has taken over the protector role. Annabelle is still wearing neworn clothes and diapers – and she likely won’t be out of them anytime soon! People always comment on how good and easy of a baby she is, and we know we are truly lucky. While it seems like she was born just yesterday, we also can’t even fathom our lives before Annabelle was born. Haha, isn't it funny how many names besides a baby's actual one you find yourself saying??? My boys have so many nicknames as well that I hardly ever say their legitimate names. She is absolutely adorable; enjoy every second, momma! Happy 1 Month pretty girl! :) She is so adorable. She is too cute! I love her headband. so sweet, all of my kids have a million nicknames too :) She is just precious! Oh she is so beautiful! I love the newborn stage! Cherish being able to hold and cuddle her! A month already? Time flies! I love the wrinkly knees! She is already rolling some! That is awesome!